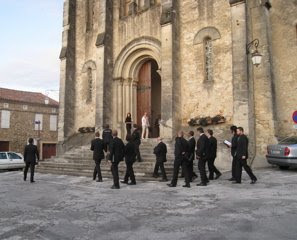 Arriving for our last concert on this tour at Notre Dame de la Paix which is beside the Abbaye Ecole de Soreze where we stayed and which houses this festival. We were hoping for some hot southern weather on our last day, but the tour ends as it began - lots of rain. 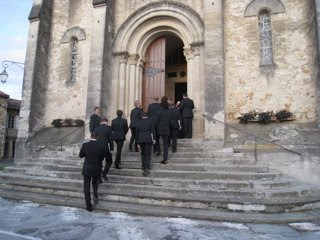 There was, however, a brief and lovely bit of sunshine through the clouds at concert time - meaning that we could make our entrance without getting drenched!